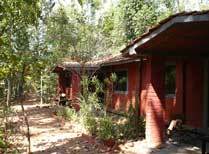 Baghvan is an enchanting lodge located a short drive from the entrance to Pench National Park with excellent service and guides. Stay in a lovely air-conditioned villa, spend time spotting tigers in Bandhavgarh and cool off with a swim in the outdoor pool. With homely accommodation, expert naturalist guides, and an owner committed to conservation, this is a great place to stay when exploring Bandhavgarh National Park. 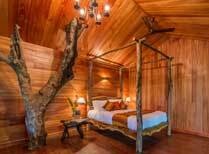 Situated on the banks of the Banjaar River, close to the quieter Mukki Gate entrance to Kanha National Park. 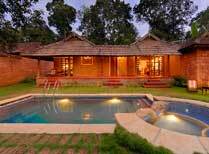 A small lodge on the outskirts of Kanha National Park with just four luxurious cottages. Tiger spotting anyone? 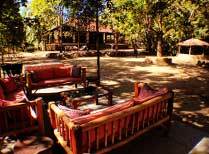 Jamtara Wilderness is a lovely tented camp on the edge of a rural village within a couple of minutes of Pench National Park. A beautiful 19th century palace with colonnaded terraces, quiet courtyards and elegant interiors just outside the city of Bhopal. A lovely getaway with guest cottages, 2 restaurants, a spa and pool bordering a forest and national park near the city of Bhopal. 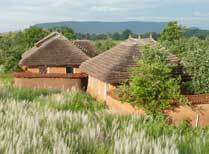 Kanha Earth Lodge is just outside Kanha National Park with strong links to local villages. 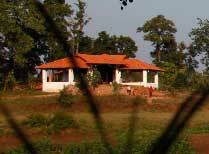 Comfy accommodation in lovely forested grounds within one kilometre of Kanha National Park. 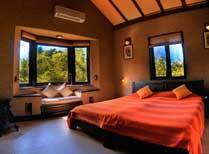 Surrounded by sal forest, Kings Lodge provides a comfortable base for exploring nearby Bandhavgarh National Park. 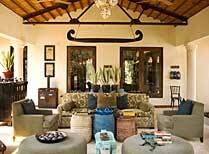 Mahua Kothi provides luxury accommodation at Bandhavgarh. 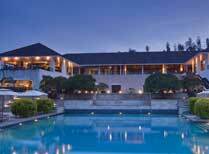 It has been developed by the Taj group with safari experts CC Africa. 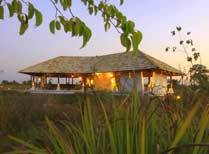 Pench Jungle Camp is a good mid-range lodge a short distance from Pench national park with a mixture of cottages, tents and rooms. 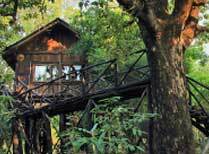 Stay in your very own treehouse surrounded by nature, look for tigers in Pench National Park and relax with a swim in the pool. 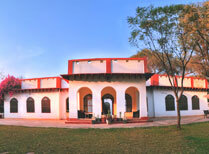 Samode Safari Lodge provides excellent accommodation and guides, close to Bandhavgarh National Park. 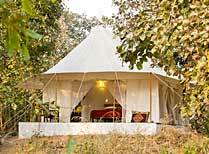 Shergarh is a very exclusive camp, situated at the quieter southern edge of Kanha National Park with excellent wildlife viewing. Close to Mukki Gate in Kanha National Park, Singinawa is a beautiful jungle lodge with 12 secluded rooms set amidst lush greenery. 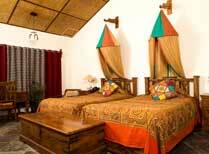 Spacious rooms set in pretty gardens make this a comfy base from which to explore Bandhavgarh and see its resident tigers. 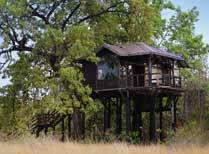 Tree House Hideaway has 5 exclusive tree house rooms spread out over 8 hectares of jungle at the edge of Bandhavgarh National Park. 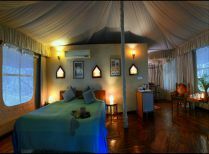 Located in the buffer zone of Pench Tiger Reserve, Tuli Tiger Corridor consists of 8 luxury tented rooms and 15 cottages. 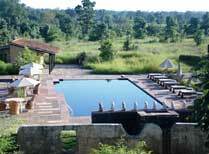 Set in 22 acres of lush greenery, Tuli Tiger Resort is about 5 minutes from Kanha's main gate. A peaceful and private beach location just over an hour from Cochin, the sound of the sea is never very far from your villa. 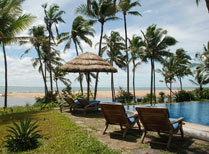 A stylish resort with a top class spa, lavish villas, beach access and a houseboat for backwaters cruises. Located on on an isolated peninsular of land, Coconut Lagoon is a great place to relax and learn about the local way of life. Stay in a private villa on an estate in the hills, a perfect setting for relaxing far away from the crowds and enjoying rural life. 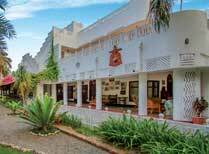 Styled as an historic palace, this hotel is a suitably grand place from which to explore the archaeological site of Hampi. Experience the peaceful location and sumptuous accommodation at Evolve Back Kabini and enjoy jeep and boat safaris in this great wildlife habitat. 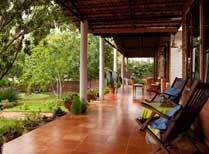 Stay with a local family in a tranquil setting, learning about Kodava culture and cuisine, a short way from Mysore. The 'palace for Ayurveda' is dedicated to improving the health and wellbeing of its guests through a full range of Ayurvedic treatments. A houseboat is the ideal way to see the backwaters of Kerala, providing a comfortable base to watch the world go by. Kerala's largest beachside resort, the Leela Kempinski is dramatically located on a cliff-face, perched between two beaches at Kovalam. 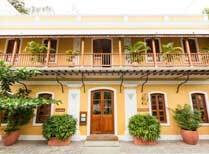 Maison Perumal is a fully restored mansion in the little-explored Tamil quarter of Pondichery with 10 guest rooms. 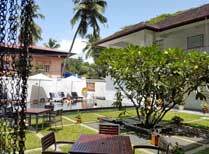 A charming, small hotel facing a quiet stretch of beach, with a restaurant, Ayurveda spa and open air pool. 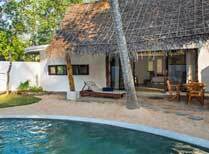 5 separate villas by Marari Beach offering spacious and well equipped accommodation, gardens, pools and beach access. 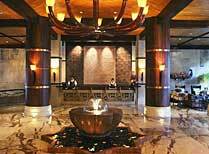 Well equipped, modern hotel with a choice of restaurants, a spa and rooftop gym and pool. 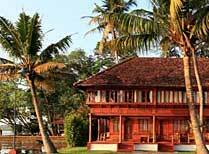 Escape the pressures of the modern world and relax in beautiful Kerala. An attractive, sun yellow building in the historic French Quarter, with 18 spacious rooms, a rooftop restaurant, spa and courtyard swimming pool. 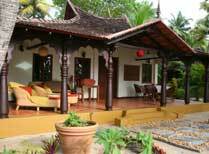 An 80 hectare spice plantation with elegant suites and treehouses, ideal for experiencing life in rural southern India. 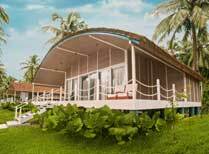 Purity is a small boutique hotel set by a lake in the Kerala Backwaters, an ideal place to relax and maybe enjoy some spa treatments. 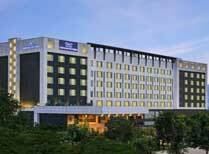 High quality hotel in a central location overlooking Ulsoor Lake. 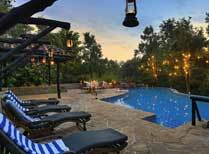 Facilities include a restaurant, spa and rooftop pool. Spice Village is an excellent base for exploring the wildlife of Periyar National Park with an excellent record for sustainable development. 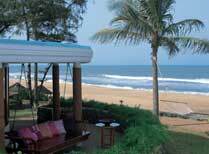 Surya Samudra is a small eco-resort on the Arabian Sea shore just 30 miles from the southernmost tip of India. A beautifully restored town mansion showcasing the region's rich artistic and culinary heritage, with spacious rooms, ample indoor and outdoor areas, a spa and rooftop dining terrace. On a remote cliff-top in Southern India, SwaSwara is a place to get away from the hustle and bustle of modern life. 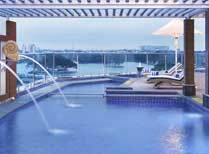 One of Chennai's best known hotels with an illustrious list of past guests, impressive range of facilities, and luxury rooms and suites. 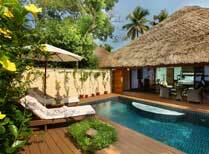 A luxury resort on a remote tropical island in the Indian Ocean, exclusive and unspoilt. 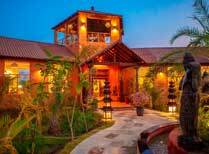 An all-villa resort set on a working coffee plantation, with opportunities for outdoor pursuits and relaxation. 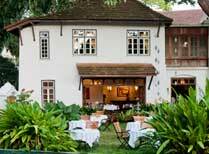 A charming resort with rooms and treehouses set on a coffee plantation, ideal for walking and relaxing. 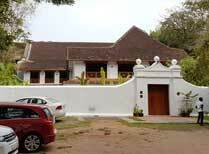 Enjoy Chettinad culture, cuisine and hospitality at Visalam, visit temples and markets and explore by bullock cart. 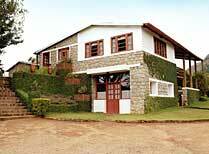 A short distance from the hill town of Munnar in Kerala, Windermere Estate is a peaceful place to relax. 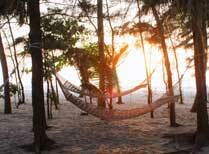 Get away from it all and relax by the beach in Kerala. The emphasis here is on escapism, privacy and simplicity. 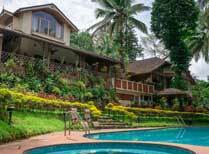 A small homestay in a quiet residential suburb, where your hosts welcome you like a member of their family. Built for the younger brother of the Maharajah of Jodhpur, Ajit Bhawan is owned and run as a Heritage Hotel by the same family. 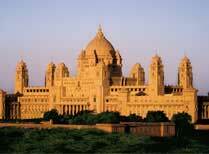 A luxury hotel overlooking the Taj Mahal. Wow! 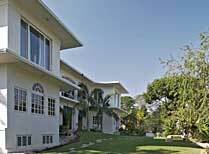 Near Rishikesh, Ananda is one of the world's top spas, an ideal place to relax and let yourself be pampered. 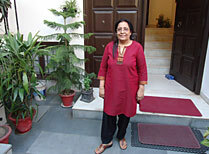 Bajaj Homestay is located a stone's throw from Connaught Place and offers true Indian hospitality. A homestay at this colonial villa adds a different dimension to visiting Jaipur, with charming hosts and Indian home cooking. 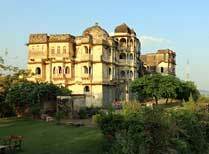 The 250 year old Bhainsrorgarh Fort is one of the most spectacular palaces in Rajasthan, in an unspoilt setting. Bundi Vilas is a beautfully restored haveli located next to the palace in this charming small town in the heart of Rajasthan. Set in farmland, Chambal is a great place to experience rural Indian life and nature about one hour from Agra. 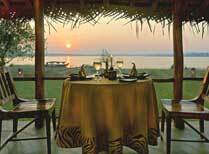 Chhatra Sagar is a tented camp with a unique location straddling a dam. 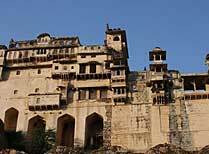 It is a great place to escape into rural Rajasthan. This family owned and run guest house is in a quiet neighbourhood, and offers homely accommodation and top notch hospitality. A modern hotel in central Agra well placed for sightseeing and with a good range of facilities including a rooftop pool and dining terrace. Located about halfway between Udaipur and Jodhpur, the small town of Deogarh is a good place to break a journey through Rajasthan. 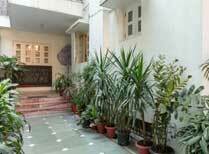 A characterful town house with an attractive courtyard and large suites just a short drive from the centre of Jaipur. 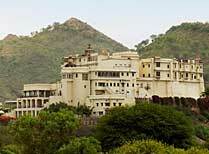 Located in the Aruvali Hills 45 minutes from Udaipur, Devigarh is one of the most luxurious palace-hotels in India. 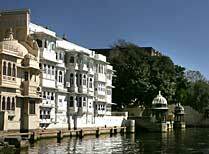 Fateh Prakesh is part of the City palace complex on the shores of Lake Pichola. 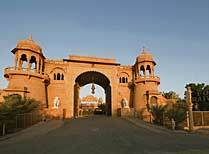 An impressive ancestral home now providing characterful gust accommodation in a rural village between Jaipur and Jodhpur. 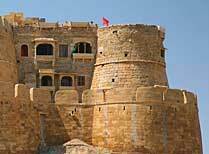 Overlooking Jaisalmer Fort, Fort Rajwada is a modern building designed to preseve and emulate the traditions of the city. 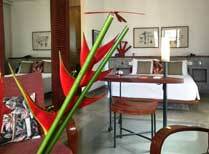 Located on the banks of the Ganges, the Ganges View is one of Varanasi's most characterful and best located hotels. 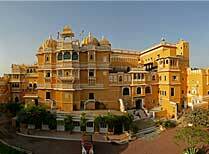 Built into the walls of Jaisalmer, Garh Jaisal provides the most characterful accommodation in the city. Gracious suites, an elegant drawing room, library, terrace and rooftop sundeck and pool, all in the heart of historic Kolkata. 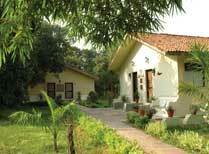 A lovely 1940s lodge near the Nepal border offering 4x4 safaris, nature walks, boat and bike rides and village visits. 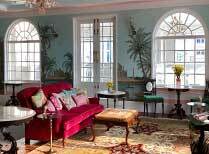 A characterful Heritage Hotel on the banks of Lake Pichola in Udaipur, a stone's throw from the City Palace. Jai Mahal is an 18th century palace that has been converted into a heritage hotel set amidst 18 acres of gardens close to Jaipur. 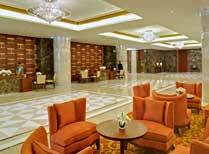 Jass Radisson Hotel has all the amenities you'd expect of a high quality hotel. 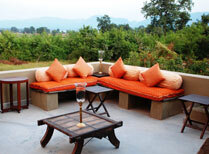 Conveniently located near to the Khajuraho temple complex. An exclusive 9-tented camp in rural Rajasthan, where you can relax far from the crowds and slow to the pace of life in the country. 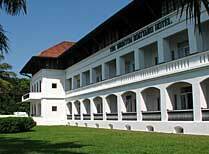 Maidens Hotel is an elegant colonial building in New Delhi, providing comfortable accommodation and three hectares of lush gardens. 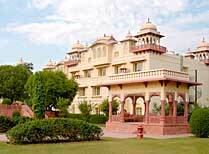 Mansingh Palace is located in the heart of Agra, near the Taj Mahal, and offers good accommodation, a bar and a restaurant. 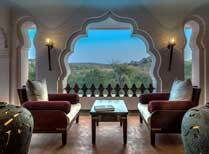 Mihir Garh is a fort-style hotel in rural Rajasthan, providing spacious suites and opportunities for exploring the countryside. 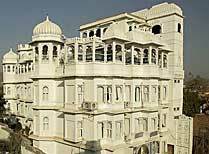 Lavish hotel centred on the home of the last Maharaja of Bikaner, full of fascinating objets d'art and with grand halls and lounges and a rooftop swimming pool. 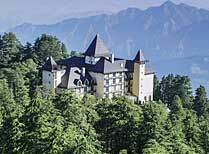 Housed in a 19th century colonial building in the heart of Shimla, the 5 star Oberoi Cecil has been beautifully restored to its orginal grandeur. Palace on Wheels is an 8-day luxury train ride in Northern India, a great way to see the many highlights of this amazing and diverse region. 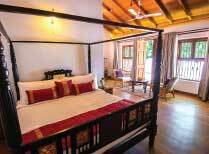 A luxury lodge with just 12 cottages set in the Vindhya Hills close to both Panna National Park and Khajuraho with its historic temples. Jodhpur's first boutique hotel, the Raas has an amazing location at the base of Mehrangah Fort, in the heart of the old walled city. 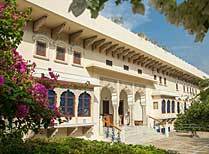 The Oberoi Rajvilas is located on the edge of Jaipur and provides a luxurious retreat from the city with unparelled levels of service. 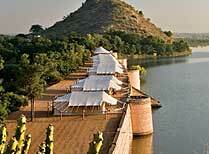 An imposing 17th century fort by a large lake offering suite and luxury tent accommodation in rural Rajasthan. 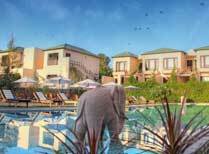 Modern hotel with a large pool, gardens and spa, just a short drive from Ranthambore National Park. 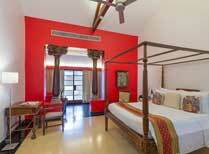 A gracious family villa transformed into a welcoming hotel about a 10-minute drive from the centre of Jodhpur. Located halfway between Jodhpur and Udaipur, Rawla Narlai is an ideal place to break your journey and enjoy rural Rajasthan. 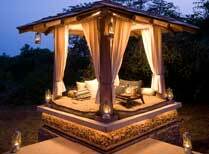 A romantic tented camp at the edge of the desert, ideal for enjoying the slow pace of life in rural Rajasthan. 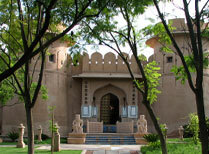 In the small town of Rohet close to Jodhpur, Rohetgarh is one of Rajasthan's leading heritage hotels. 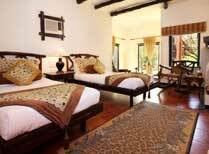 Samode Haveli is an intimate heritage hotel in the heart of Jaipur offering excellent service in a beautiful setting. 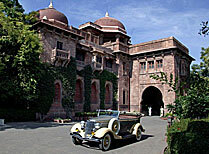 Samode Palace is one of India's finest heritage hotels, providing luxurious accommodation in the small town of Samode. 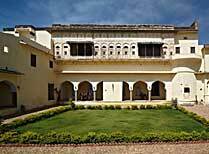 Once the summer home of the rulers of Shahpura, Shapura Bagh is a perfect spot to escape from the hustle and bustle of the cities. 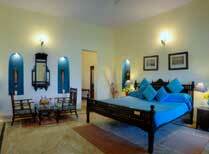 Shahpura House is a good value for money heritage option with friendly service in Jaipur. 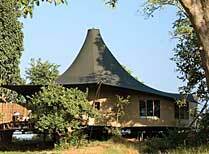 Sherbagh is an excellent tented camp bordering on the buffer zone of Ranthambore National Park. 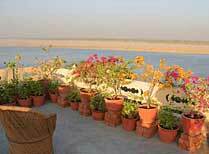 Suryauday Haveli is a small hotel located near Shivla Ghat on the Ganges River in Varanasi. 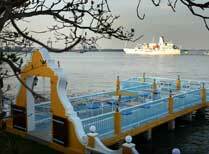 Set in several hectares of gardens, the Taj Ganges provides a haven of peace in this bustling city. 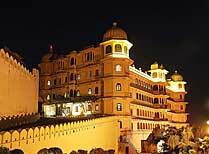 A famous, luxury, historic palace hotel in the middle of Lake Pichola in Udaipur. 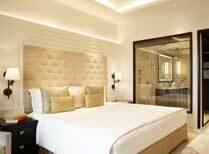 Tajview Agra provides comfortable accommdoation in central Agra, with many rooms enjoying a view of the Taj Mahal. Nestled in the Aruvali hills, the Adohi provides a peaceful place to explore the famous fortress of Kumbhalgarh and nearby wildlife sanctuary. The Bagh is a heritage hotel in ten acres of 200 year old gardens and orchards, close to the town of Bharatpur and its famous Bird Sanctuary. 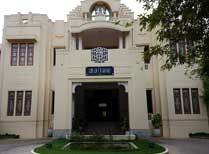 The Claridges has been one of Delhi's landmarks since the 1950's. This gracious building has been restored to modern high standards. 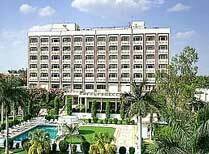 The Imperial in New Delhi is recognised as one of the best hotels in the world, providing everything you'd expect from an international luxury hotel. A modern hotel near the international airport, with well equipped rooms, a choice of restaurants, spa and small outdoor pool. 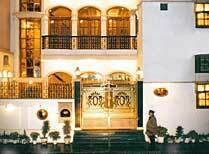 The Park is located in the heart of New Delhi and offers high quality accommodation and excellent facilities. Enjoy the friendly hospitality of your hosts, take safaris, tour the famous temples of Khajuraho and go for boat trips on the Ken River. Located about a mile from the world famous Taj Mahal, the Trident is a modern hotel which is an excellent base for exploring Agra. Tuli International is a comfortable, modern hotel located in the heart of the vibrant city of Nagpur, offering a range a facilities to enhance your stay. 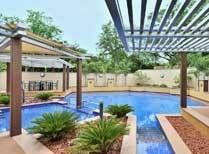 An elegant, owner-run city hotel with stylish accommodation and a lovely roof terrace restaurant and swimming pool. 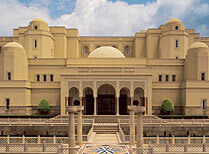 The last great palace of Rajasthan, Umaid Bhawan is a unique palace hotel and staying here is an unforgettable experience. Once the summer retreat of Lord Kitchener, Wildflower Hall is a luxury resort and spa in the forested foothills of the Himalayas. 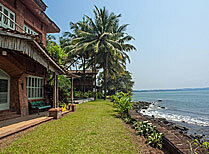 Ahilya by the Sea is a beautiful hotel full of local character near a quiet village in North Goa. 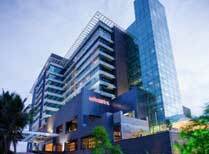 Fariyas Hotel is a short walk from the Gateway to India in central Mumbai and offers well equipped accommodation and a full range of amenities. Lion Safari Camp offers luxury accommodation in a mango orchard overlooking the Hiran river, a perfect base for exploring Gir National Park. 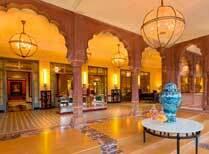 One of Mumbai's landmarks, the Taj Mahal Palace & Tower has opulent decor and great views.